D.O.T. (Department of Transportation) approved Push to Connect fittings are the most commonly used connection in air brake applications. The compact style of a Push to Connect fitting is well suited for installing in confined areas. However D.O.T. regulations require all nylon tubing air brake connections have fittings with an inner tube support. The tubing slides into the fitting and the metal inner tube support slides into the tube. This provides a more solid connection for over the road air brake systems. Compression fittings are also suitable (and D.O.T approved) for many air brake applications and usually cost less than Push to Connect fittings, yet they are not as quick and easy to install, connect and reconnect. Quick installation, reduced maintenance and less chance of leakage makes up for the higher price of Push to Connect styles in most cases. In addition, compression fittings must be installed with tools, which can be time consuming and more difficult in tight spaces. Where Push to Connect fittings are installed or removed easily without the use of tools, saving time and reducing the possibility of causing damage to surrounding components or equipment. The nut on a compression fitting must be turned to a specifically rated torque to ensure the proper seal, whereas a Push to Connect fitting does not have a compression nut. Instead a leak free seal is achieved by easily pushing the fitting onto the tube or hose. And compression fittings often need to be retightened to stop a leak. 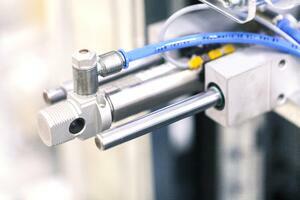 This can cause crimping or distortion of the tube, which increases the chance of future leaks. However, Push to Connect fittings rarely requires adjusting after installation in order to remain leak free. 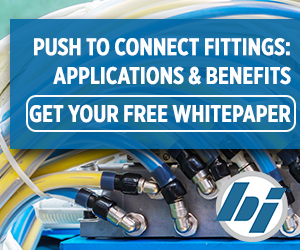 If you'd like to learn more about PTC standards, applications & specs, click here or below to download our latest whitepaper that includes comprehensive information about PTC Fittings!